The Crimson Tide are inching closer to the field, while the Red Storm might be in trouble. Both, and every other bubble team for that, might want to keep a wary eye on West Virginia, however. Last season, Collin Sexton put the Alabama Crimson Tide on his back in the SEC Tournament’s second round, as he went coast-to-coast to defeat the Texas A&M Aggies 71-70 at the buzzer. That win pushed the Tide in the 2018 NCAA Tournament as its second-ever 15-loss at-large team. One year later, 18-14 Alabama again pulled off a dramatic day-two victory, this time over the Ole Miss Rebels, a squad that was safely into the field — much like last season’s A&M outfit — 62-57. 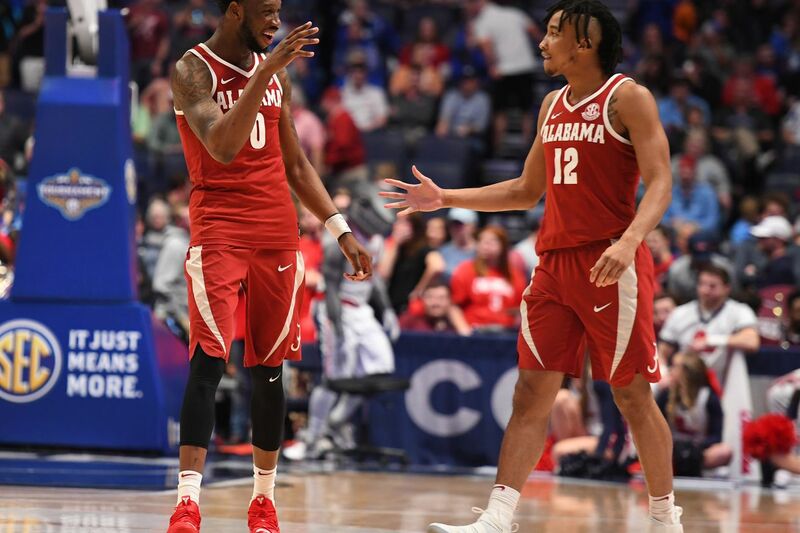 Tonight’s win puts Alabama on the cusp of yet another bid, with tomorrow night’s quarterfinal matchup with the second-seeded Kentucky Wildcats offering a tantalizing opportunity to lock it up. Of course, history is not on the side of Avery Johnson’s squad, as John Calipari’s Wildcats have lost just three SEC Tournament games in his nine previous trips, and none since 2014! The Minnesota Golden Gophers are the evening’s other big bubble winner so far, as they took down the Penn State Nittany Lions 77-72 after overtime in the pair’s Big Ten Tournament second round game in Chicago. Richard Pitino’s Golden Gophers will next play a Purdue Boilermakers squad they defeated on March 5th in tomorrow night’s third quarterfinal matchup. On the flip side, there’s the St. John’s Red Storm, blown out on their part-time home floor at Madison Square Garden by a Marquette Golden Eagles squad they had swept during the regular season — which happened to be on a four-game skid. The 86-54 loss is a poor final impression to leave on the Selection Committee, particularly with a NET ranking of 64 heading into today. Still, St. John’s 10-10 record in Quadrant 1 and 2 games, with five Quad 1 wins, including the pair over Marquette and others over the Villanova Wildcats and VCU Rams should be enough, even if Chris Mullin’s team has to play an extra game in Dayton. Possibly complicating matters is the resurgence of the West Virginia Mountaineers in the Big 12 Tournament. Last night, Bob Huggins’ club fortuitously escaped the Oklahoma Sooners in the 7/10 game. Tonight, they knocked off the second-seeded Texas Tech Red Raiders, the Big 12 co-champs, 79-74. At 14-19 and ranked 110th in the NET heading into Thursday, the Mountaineers will meet the Kansas Jayhawks-Texas Longhorns winner in tomorrow night’s second semifinal in Kansas City. So after Thursday’s early evening matchups, here’s a fresh look at the cut line. My next update will come with Friday morning’s full bracket projection.